New Listing on Oxbow Lake! 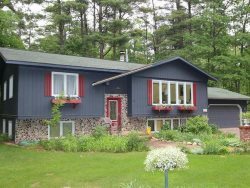 Escape to Loon Cottage in Presque Isle, Wisconsin! Enjoy the peace and quiet of the Northwoods at this lake front home on Oxbow Lake with private dock and sandy shoreline perfect for swimming. Listen to the call of the loons as you relax in the 3 season screened in porch or gather around the fire pit to enjoy time together watching the stars and crackle of the fire. With everything you need, Loon Cottage offers the perfect getaway destination including a washer and dryer, WiFi internet, satellite tv and so much more! For year round fun, opt outside with snowmobile trail access nearby and spacious parking for your toys and trailer. Traditions start here! Come stay and play at Loon Cottage for memories that will last a lifetime. New summer picture coming this summer! Don't forget to book your Pontoon rental with us! CLICK HERE! Take advantage of our Home & Boat Discount - Rent together and receive FREE delivery! To see all of our available specials, CLICK HERE! Oxbow Lake is a 523 acre lake located in Vilas County. It has a maximum depth of 44 feet. Visitors have access to the lake from a public boat landing. Fish include Musky, Panfish, Largemouth Bass, Smallmouth Bass, Northern Pike and Walleye. The lake's water is moderately clear. CLICK HERE for more information about Oxbow Lake!